and the individual Hobbiest and the so-called Do-It-Yourselfers who require quality handpiece repairs. Our services guarantee reliable, fair-priced handpiece repairs. 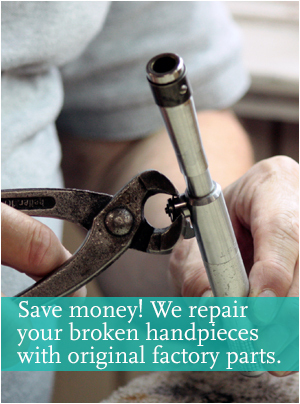 Our repaired handpieces will last you as long as a new unit. We are your one stop shop for quality handpiece repairs. The inside of a handpiece tells us much about how it was cared for and maintained. Our experts can advise the craftsperson using the tools on how to avoid unnecessary repairs and problems. All rotary and hammer types used on flexible shaft machines, including obsolete handpieces no longer being manufactured. We repair some obsolete handpieces that were used by a select group of crafts people. We make it simple to get reliable repair service with free pick up service anywhere in the United States. We are authorized resellers of the most popular jeweler's handpieces from Badeco, Faro, Foredom and Pfginst. We offer new or reconditioned handpieces with surface stratches (from normal usage) at a reduced price with a 2-month guarantee. 1. Free pick-up anywhere in the United States. Simply pack your handpieces in a box, adhere label and we will make all the necessary arrangements for pick-up. 2. We provide free estimates on all repair work prior to making repairs. 3. We will call you once we receive your repairs and provide a free estimate. Once you provide repair approval, our skilled service technicians will disassemble, evaluate and repair your handpiece using only original factory parts. Our repaired handpieces meet industrial expectations as well as your own professional expectations.This is done by providing you a two-month warrantee from the date stamped on each repaired handpiece. 4. We test all of our repaired handpieces prior to returning the handpiece. We are committed to exceeding your expectations to help avoid returns and down-time for customers. 5. Loaner Service! If a customer is in need of a loaner handpiece during repairs, we can overnight a piece (at your expense) to avoid interruptions of work. 6. Quantity Discount! Besides our reasonable repair prices, We offer a quantity discount. If you send in 6 repairs, you pay for only 5. This is our way of showing our appreciation for considering our repair service. 7. Referral Program! If you refer a customer to us, make sure they mention your name and you will receive a 10% discount on your future handpiece repairs. 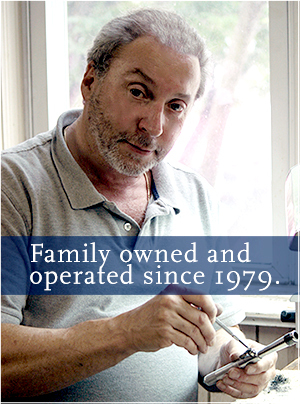 Our staff is committed to providing you the best handpiece repair experience. Please call us at 1.718.339.2640 or email service@jewelershandpiecerepair.com to speak to one of our repair technicians about your handpiece needs. Be it repair or new or reconditioned handpiece sales. At fair pricing, always!